The Abdus Salam International Centre for Theoretical Physics (ICTP, Italy) along with the North South University (NSU, Bangladesh) is organising the first ICTP Regional Microelectronics Course on VHDL for Hardware Synthesis and FPGA Design in South and Southeast Asia, from January 31 to February 18, 2011. 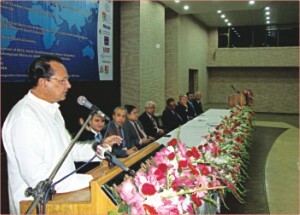 There are 32 public and 50 private universities in Bangladesh. Almost all universities have electronic courses. But due to the lack of expertise and resources the curriculum and lab activities of those courses are not as advanced as the modern electronic industry. The worst sufferers of this lapse are the electronic engineering students, who barely get a chance to get acquainted with the technology they would face in their professional career. The course mentioned above is intended as an advanced training in microelectronics, to introduce physicists, engineers and computer scientists to state of the art design methodologies for Programmable Logic Devices (PLD). The purpose of this activity is to provide training in the latest Field Programmable Field Arrays (FPGA) design methodologies based on hardware description languages and logic synthesis. It also offers a broad view of modern integrated circuits and VLSI design. It is a unique opportunity to get into the FPGA world from basic to complex aspects through its intensive programme, from step-by-step tutorials to implementation of the fairly complex projects. “In the world of electronics, experimentation is a very expensive task. Before we can produce a single chip in the industry, we have to verify every aspect of it minutely. So, rather than investing large amount of money in making prototypes of a device, simulating the hardware can be implemented to exponentially reduce costs. FPGA and PLD are such tools that help to simulate real hardware. That is the reason this course will help the students, especially the engineering students to have a much better and more practical view on these tools,” says Dr Miftahur Rahman, Chairman of the EECS (Electrical Engineering and Computer Science) Department of NSU. “We have a gold mine of creative minds. But due to our age-old education system, lack of progress in the research and development sector and many other socio-economic reasons obstruct us to nourish those minds. Our sons and daughters are making their mark abroad but Bangladesh still lacks necessary proactive and creative engineers. Such prestigious courses will help develop those enthusiasts and create an opportunity within the country to think and create and contribute to the country's technological development,” he adds. The course organises lectures on technology trends, EDA (Electronic Design Automation), FPGA, VHDL, digital system design and reuse methodology for system-on-a-chip designs. Lecturers for the course includes Prof. Nizar Abdallah from Actel Corporation, Prof. Piruz Bazargan Sabet from Marie Curie University in France, Dr Pablo Moreira and Dr Alexander Kluge from CERN in Geneva in Switzerland and many other professors from prestigious institutions all over the world.